How about letting our custom cabinet makers build the entertainment center of your dreams. This one is made of wood but finished to look like marble. It hides the equipment nicely and looks great in the room. The electronics housed in this unit are not only for this TV, but the entire house as well. This customer had 3 requirements - make the room as large as possible, hide all the equipment, and would it be possible to turn the plasma so they can watch it in the kitchen. Our customers tell us what they want and we make it happen! We are custom installers. Our vision makes your dreams a reality. It's Saturday night at the movies...in your very own basement! 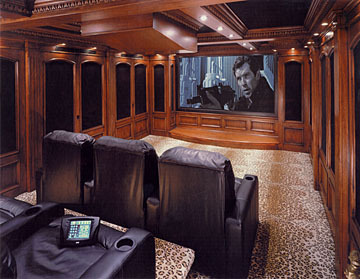 Having you own home theatre is only a phone call away. Suburban Audio and Video can customize your home theatre experience to meet your exact needs..
You enjoy your music in your home, why not outside? You wont see any unsightly wiring and you will have much better sound than your iPod ear plugs - and besides, you can't swim with your iPod! This picture shows a satellite dish, 2 speakers, a volume control (Not painted to match yet) and an intercom speaker, all neatly placed without a wire in sight. "It's Only a summer house and I don't want to spend a lot of money." Big dreams? small budget? Honesty and integrity and a very strong work ethic makes sure we get your job done right, on time and for a very affordable price. No surprises! "I want my plasma to sit flush on the wall. I also want it to pull out and turn 90 degrees left or right." Yeah, we can do that! We are custom installers. Our vision makes your dreams a reality. "I want one of those big TVs with great sound, but I don't want to see a whole lot of speakers and electronics all over the place." The solution? Sound Advance invisible in-wall speakers. We had to take the pictures before painting, otherwise you couldn't see the speakers. The electronics are in the hall closet. Out of site, but never out of reach. Customer wanted a Plasma with surround sound in his basement and wanted the equipment accessible so he could burn and load DVD's and plug in XBOX controllers. His wife didn't want speakers and electronics all over the place. We put the equipment in the wall behind smoked glass doors, in dead space under the stairs. The subwoofer is in wall and the rear surround speakers are in the ceiling. Everything is tucked out of site and does not interfere with the feel of the room. The result was a very satisfied customer. 1. No TVs mounted to the fireplace. 2. Customer does not want to see any equipment. 3. We can't run wires from below the room. 4. The customer does not want to have to turn his head to either side to see the TV. 5. It also has to be easy to use. What is the customer going to do? Is this a job for "Extreme Home Makeovers?" Nope! Suburban Audio and Video has it all under control. Things are looking up. Up to the ceiling that is. All of the equipment is housed offsite in a custom made cabinet. And the final requirement? Easy to use. The customer pushes "ONE" button on the remote. The lights dim automatically, the projector and screen lower from the ceiling, and the movie begins. The customer never dreamed of such a system. Tell us what you would like, we will make it happen! We service the tri-state area (PA, NJ, DE) and beyond. Feel free to give us a call at 215.322.2111 to schedule a consultation.